My chaptered Twilight fics are abandoned. My chaptered Walking Dead fic is abandoned. I have a tendency to drag my characters through horribly angsty situations that may, can, and will traumatise them emotionally. This is so that they can climb out a changed person on the other side. The situations I put my characters in may include violence, abuse, domestic violence and abuse, sexual coercion, sexual assault, forced marriages, forced pregnancies and the death of loved ones (including pregnancies and children). I often have characters that experience mental illness that may result in the need for counselling. I may use gore as a shock factor at times. 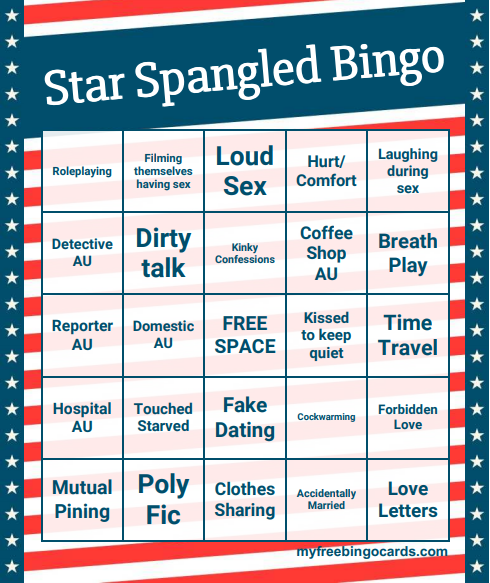 I will rate anything that has these sorts of themes as mature or explicit but if tagging for one of these situations would reveal a major spoiler, I'm reluctant to do so. If any of these situations (or others) may trigger you, I do apologise and encourage you to private message me so that I can give you warnings up front. I don't want to upset any of my readers. Fanfiction is something we all indulge in and I believe we should be able to curate our experiences to things we enjoy. In order to facilitate that, if a story sounds interesting (even as a WIP) but you'd like a more thorough warning of anything that may present itself within the story, please message me. I wrote 1,490 words this week. I start mood-modifying drugs again tomorrow. I hope they'll help level me out so I'm not having these every-other-month lows. I mean, looking back at my weekly stats definitely shows a cyclical pattern in my writing. It's obviously not just my writing but it is reflected there in nice easy to understand numbers. I wrote 12,049 words this week. Mostly at the beginning of the week. Depression brain kicked back in so I'm just trying not to go back to bed most of the day. I wrote 12,320 words this week. My day one of April Camp NaNo wasn't a very promising start because of anticipatory anxiety for jury duty (it got cancelled, heck yes!). Again, hoping I can get on track so I'm not behind the entire month. 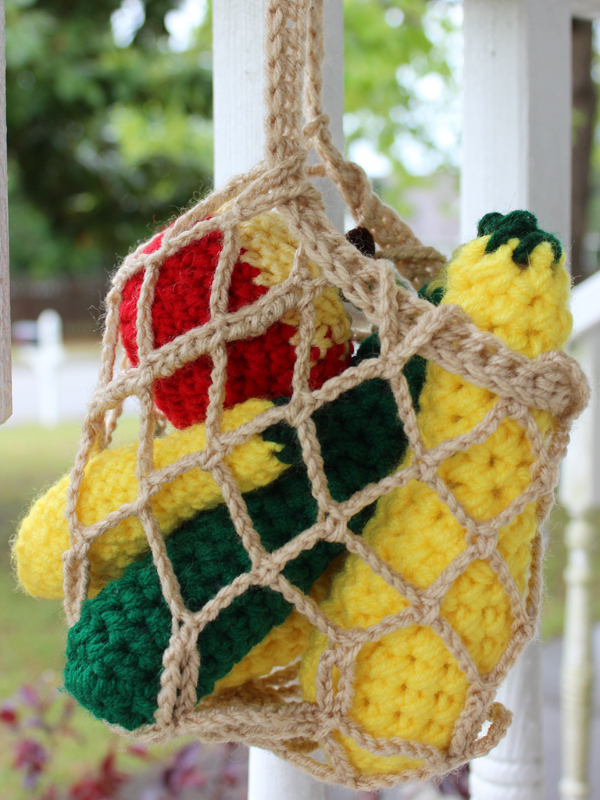 I also need to make time to crochet. I told one of my caprbb authors that I would be making a second picture. The time is closing for me to craft the things I need for that. We Named Her Evelyn - This is my Camp NaNo project! Love Marks the Soul - This is my wipbigbang project! 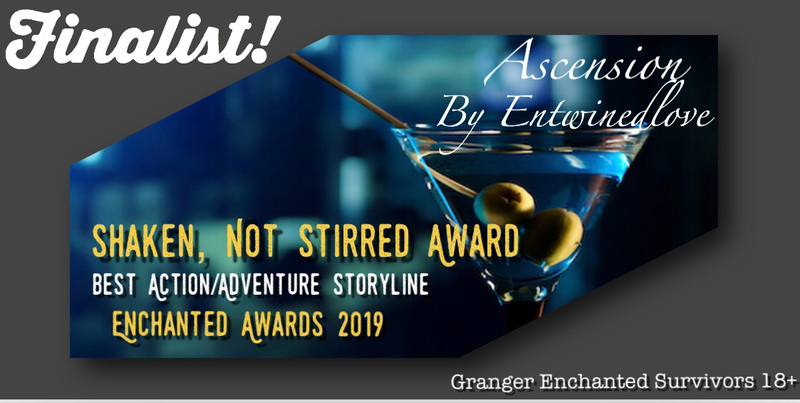 45 scenes, rough estimate of 35k words - I'm hoping to get at least a few scene done for the first check in but the majority of this project has been pushed to May. I think. *This is my minimum word count goal to keep me on track for the rest of the year (1k a day). If I complete everything on my queue I'm looking at about close to 80k. 75k. The first English fic for the the TV mini-series Labyrinth on AO3! Will be revealed later in April! I also crocheted about 50 hours this week. *These stories are part of the stuckyaubang! Ginny starts having bouts of Loki-like accidental magic, complete with golden glow. Frigga is the one to figure out why. *When I asked for a change, the Free Space disappeared and a blank square was in the bottom corner. 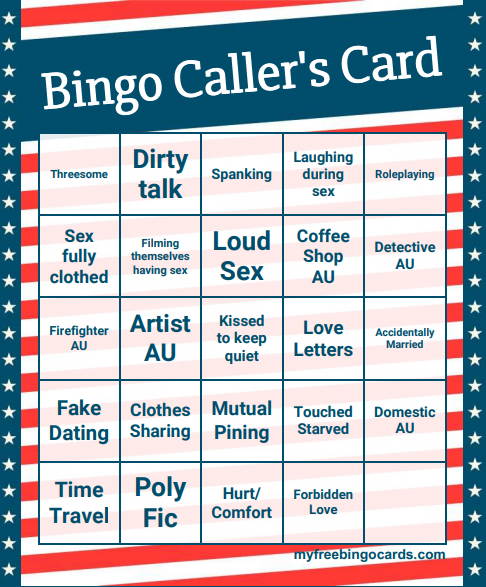 I've rearranged it to look like a proper bingo card. And edited a few of the words. RULES: List the first lines of the last ten stories you published. Look to see if there are any patterns that you notice yourself, and see if anyone else notices any! I tend to start with a character and establish a POV first rather than elaborate on a setting. Sometimes I think if my work were for the stage it would be a minimalist sort of thing with only a few props and not much of a backdrop. I wrote 18,578 words this week. And I completed my CapRBB fic last night! Woot! I might not make 50k in 15 days because I had a few low days where words just didn't want to happen but never say never, I guess. 6 days at 4k is still technically feasible if a bit unlikely. There are two more bangs that I'm thinking about signing up for but the signups either haven't opened yet or they're open for a bit longer, so I'm going to think about it for a while before doing it. I wrote 11,254 words this week. Over half of that was done in the last two days. I decided I was going to try to finish my caprbb and my shrunkyclunksbigbang stories by the end of the month, which according to my estimates would be about 50k. So 50k in 15 days. I've done that three years in a row for NaNo, so, yeah. I haven't written at all today though, because, migraine. It's eased so after the news, I'm definitely going to try. I need to edit the next chapter of Winter's Tale, I let it slip up on me so I'm not ahead anymore. I did 23 hours of crochet too. I signed up for fluffbingo and shrunkyclunksbigbang and in a few days I'm going to sign up for wipbigbang and buckybarnesbingo. (wth am I doing, right?). Oh, and I'm planning to do Camp NaNo. If I want to make 50k in 15 days, I need to write 3,311 words today and each of the next 12 days. I wrote 3,552 words this week. I got some words on my CapRBB! Yay. <-- I feel like that is the most sarcastic, craptastic yay ever, by the way. I'm having the hardest time focusing. Words feel like molasses. 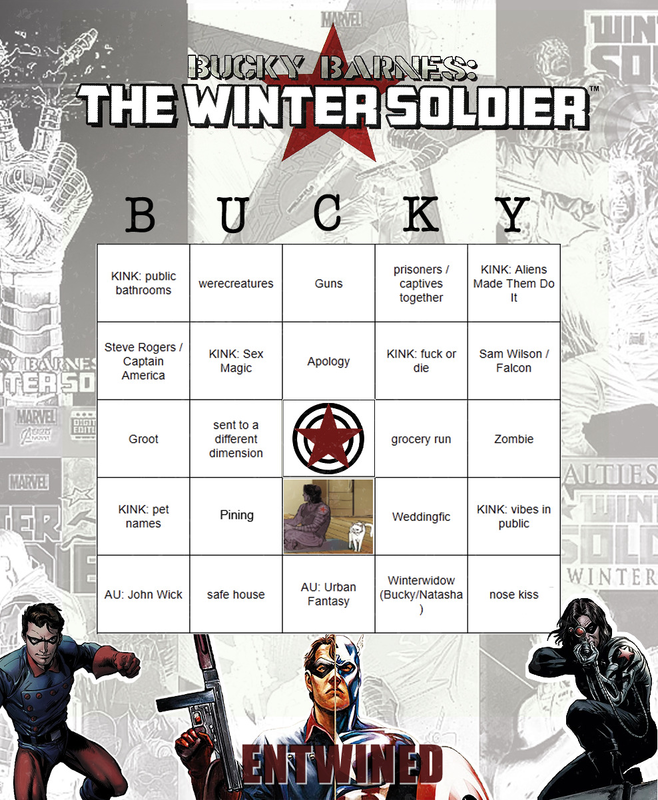 And my dumb brain is like, "oh there's a Bucky Barnes Bingo starting up, and a Fluff Bingo, and the Shrunkyclunks Bang I wanted to sign up for. Oh, now there's a GYWO Yahztee, I should sign up for those!" No, I shouldn't because then I'll just have even more on my plate. But all of the requirements are low. Just small things to get the words flowing. There were 20 hours of crochet this week. I honestly don't know what I've been doing besides writing and crocheting. I guess a big chunk was researching for my CapRBB fic but I still feel like I'm missing hours of my days somehow. I guess that's executive dysfunction. If I wanted to commit to catching up like that post from GYWO suggested, I'd need to write 4,181* words every day for a week. Which when you look at my NaNo totals, doesn't sound unattainable but from this spot in this word ditch I'm in, it looks insurmountable. *If I did my math correctly. I may not have, it's one of those days/months/years, it seems. I wrote 2,728 words this week. I wrote a one-shot that I edited but haven't actually posted yet (plus it is going to be part of a collection that won't get revealed until April). And I got about 1k words on my Shrunkyclunks piece. Claims for RBB happened and I claimed something, so I've been trying to plot that out. I spent most of today editing the next three chapters of Winter's Tale. I want to tell myself that I'm not playing catch-up because I dropped the Time Travel Fix-It but no, that's not true. I still want to finish these two by the end of the month which was my original goal. Maybe the overwhelming sense of "how do words work again?" will go away. Claims for caprbb are tomorrow. I'm still debating whether I want to claim anything. With this apathy/depression/whatever I feel like I might not be able to do the beautiful artwork justice. My Stucky AU Big Bang fic! Please give bastgrr love for her beautiful artwork! I also crocheted for about 121 hours this month and spent 3 hours drawing. I haven't written in weeks other than a few sentences here and there during Winter's Tale edits. I did submit art for caprbb, so maybe that counts as productive. I also binge watched both seasons of Westworld, in like, three days. So there's that, I consumed media! Yay. *These stories are part of the Stucky AU Big Bang! I wrote no words this week. I did keep up with editing and posting Winter's Tale and I did crochet about 42 hours this week. Now that the art part is done for CapRBB (though I am planning on making one more piece), hopefully, I can return to writing. Or I could just binge watch the second season of Westworld and hope this migraine eases soon instead.